The place that I lived in longer than any other place would be Big Spring, TX. I think the population is around 23,000. It's not very big, it is economically depressed, and really is a lame place to live. 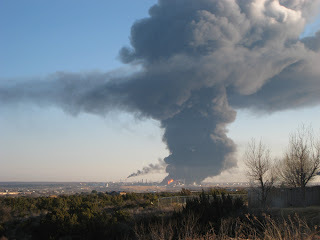 Anyway, they have a big oil refinery there, and it exploded today. Only 4 people were injured, but it was big. People all over town and even in towns many miles away heard and/or felt the explosion. It even made national news! We're famous now!